There’s nothing like a product launch to crank a technology company’s content machine into high gear. Product marketers often spend a great deal of their launch efforts creating or updating content like datasheets, PowerPoint presentations, case studies and more. The nagging question, though, is: Do our buyers really consume any of it? Given the time and expense that technology companies put into launching products, content is a critical piece to get right. And if buyers aren’t reading white papers or watching videos about our new release, then what’s the point of all this effort? After working with quite a few companies on their product launches, my observation is we’re creating content that’s not answering buyers’ questions about our products. Rather, it’s a form of “checklist marketing” where we quickly check off another completed launch deliverable from our very long to-do list. But given the high stakes for product launches, we really should do better. If we’re not creating high-value content that really answers our buyers’ questions through every stage of the sales cycle, we need to consider a different approach. To understand how buyers navigate the B2B technology purchasing process, let’s take the example of an IT director who works for a mid-size company. He needs a solution to manage employees’ personal devices that require access to the corporate network. He’s found a few vendor recommendations from analyst articles, but now he needs to research solutions, decide which best match his requirements, and make a recommendation to his boss, the CIO. And he needs to do all of this before next year’s budget is set which gives him exactly one week. IDC found technology buyers spend 18.6% of their time, or the equivalent of almost 1 day per week, on pre-purchase IT product or solution-related activities. ¹ Our IT Director will likely sift through loads of online information – most of which will be irrelevant -- until he finds possible solutions. After hours of research, he may still have questions that can only be answered by calling a vendor’s sales representative (something he was hoping to avoid until later in the sales cycle). Unfortunately vendors’ websites often aren’t much help in his quest. But if serendipity strikes, and he does find a website with the information he wants, he’ll likely hang out there and read more. He may give his contact information to get a white paper. He may read emails the company sends with helpful information on what to consider when choosing a management solution. He might watch an interview with the company’s founders on why they developed their solution based on issues they saw IT Directors struggling with. If the company offers the information he needs, a level of trust and comfort develops. And our IT Director is far more likely to purchase from them. Communications says buyers find relevant online content only 42% of the time. ² Most of it is riddled with sales pitches, marketing fluff, and other very unhelpful information when they’re in the midst of justifying a major purchasing decision that could be pivotal to their career. Our buyers’ desire to self-educate and spend a great deal of time researching before they contact us turns the typical B2B technology sales cycle upside down. No longer is the selling process driven by your sales team, but by the buyer. They decide what online content is relevant and helpful, and they choose when to reach out to you for more information. To have a successful product launch that captures mindshare, generates leads, and results in sales, you need to embrace this change and make content a priority in your launch plan. Not just any content, but buyer-centric content that focuses on educating -- not selling. If you do that successfully, you’ll have a secret weapon that sets you apart from your competitors. An excellent tool for creating high-value content that satisfies your buyers’ information needs at each sales cycle stage is a Buyer/Content Matrix. 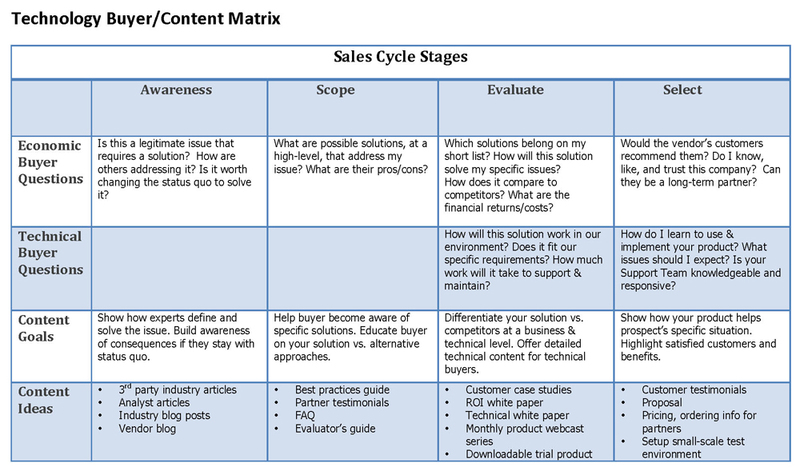 The Matrix maps your key buyers’ concerns and questions at each sales cycle stage to content that answers them. It’s a great method for succinctly capturing the key elements your content needs to address. The Buyer/Content Matrix helps you develop content that resonates with your buyer, because it’s squarely focused on their concerns and issues. Rather than automatically creating a datasheet, PowerPoint presentation, and white paper for your product launch, it forces you to look at your buyers’ concerns and issues and think about what best addresses them. You may still create your standard launch content, but it’s far more likely to be high-value and helpful rather than a feature/benefit dump. The Matrix is also a good tool for educating other marketing teams, like Marketing Communications, about buyers’ key concerns. It’s helpful in creative brainstorming sessions for generating new content ideas. And it reinforces the need to create educational content – not marketing fluff – because it addresses buyers’ key concerns. B2B marketers who have a very effective content marketing process are 50% more likely to create content for specific buying cycle stages. Less effective marketers are less likely to tailor content in any manner4. Most technology companies create content for later buying stages like Evaluation and Selection, when buyers are assessing vendors’ solutions and preparing a short list of candidates. However, we also shouldn’t forget earlier stages, like Awareness and Scope, when buyers are starting to explore solutions. If you develop content that truly helps buyers at these early stages, you begin to build a relationship and have a much greater chance of engaging them throughout the sales cycle. To build the Buyer/Content Matrix, start with the activity Pragmatic Institute recommends all product marketers do regularly: in-depth, ongoing buyer research such as Win/Loss interviews and informational interviews. The goal is to understand your 1 or 2 key buyers extremely well, including their buying process and concerns at each sales stage. The more deeply you understand their questions and concerns, the more on target your content will be. What circumstances will cause them to look for a solution like yours? What will drive them to change the status quo? What information do they need to adequately scope and define their problem? What information do they need about possible solutions? How important are peer recommendations? When do they usually utilize peer recommendations in the sales cycle? How do they research solutions? What resources do they typically use? How much is at stake for the buyer? Is this a major purchasing decision? Who else is involved in the sales cycle, and what are their information needs? What is the typical buying cycle length? You can also include your Sales team in this information-gathering exercise. Are there questions they regularly get from buyers indicating a need for additional content? When do prospects ask these questions – early in the sales cycle or later? What existing content seems to work well? What doesn’t work so well? Based on knowledge gathered during buyer research, map your buyers’ information needs to each sales stage. Put yourself in their shoes and list their concerns. I suggest doing this exercise for both the key economic and technology buyers as they often have different information needs. I don’t recommend including more than two buyers in the Buyer/Content Matrix; however, as it quickly becomes complex and requires building more buyer-focused content than most companies can resource. Define your content’s high-level goals for addressing buyers’ questions. For instance, what information do they need in the Awareness stage when they’re still defining and understanding their challenge? What do they need in the Evaluation stage when they’ve defined objectives and are starting to create a short list of vendors? List specific content ideas for each sales stage that address the buyers’ questions and satisfy the content goals. Focus on content that is high-value, educational, and helpful. Mix up content formats such as written documents, video, interactive applications, and webinars. A variety of formats keeps your content interesting, and it addresses different learning styles. As you develop content ideas, build a path of content touch points that guides buyers from one sales stage to the next. This is akin to thinking like a teacher creating a lesson plan: What do your buyers want to learn, and what can you create that helps? For instance, if you plan to create a product launch evaluator’s guide for the Scoping stage, think about the next logical piece of content. Perhaps a video of a customer explaining why your solution is a good fit for their environment? Or a multimedia tool that asks buyers questions about their needs and makes helpful recommendations? Or an ROI white paper illustrating various solutions in your product category? One application of content touch points is creating an email lead nurturing campaign to educate buyers about your launching product. Your Marketing Communications team can build a series of auto-responder emails to be sent automatically, to those who’ve requested communications from you, over a specific time period. Each email provides a piece of helpful information from the Buyer/Context Matrix that logically builds on the previous email’s content. Calls-to-action in each email can drive buyers to additional helpful content on your website. It’s important to keep the emails educational and not push selling. This is a great low-pressure, high-value method to educate buyers. But is This Really Product Marketing’s Job? Perhaps you have lingering doubts that building a Buyer/Content Matrix isn’t really Product Marketing’s responsibility. After all, doesn’t the Marketing Communications team own product launch communications? They’re usually tasked with a launch’s tactical outbound marketing activities like webinars, case studies, videos, and more. Here’s why I believe Product Marketing needs to own the creation and updating of the Buyer/Content Matrix: They understand the buyers. From doing buyer research, they are in the strategic position to understand the types of information buyers want at each sales cycle stage. Technology buyers want, and will utilize, high-value content you create. But buyer research needs to be conducted in order to create an accurate Buyer/Content Matrix and that responsibility falls to Product Marketing. Other teams, like Marketing Communications, depend on Product Marketing’s deep buyer insights to guide their outbound marketing efforts. A Buyer/Content Matrix helps all the marketers in your organization create useful, buyer-focused content for your product launch. Given the changing sales process and our buyers’ desire to research and self-educate for a longer period in the sales cycle, product marketers need to embrace that shift and provide buyers with the content they want and need. Deeply understanding buyers is the first step. Capturing that essential information in the Buyer/Content Matrix helps marketers create high-value launch content that really addresses our buyers’ information needs. And that’s a key step to building relationships and helping buyers know, like, and trust you. So crank your content machine into action by creating meaningful, high-value content for your next launch. Your buyers will thank you for it. “B2B Content Marketing: 2012 Benchmarks, Budgets and Trends,” Content Marketing Institute and Marketing Profs.